Home/Animals and Sound/Sound Reception/How do aquatic birds hear? In-air hearing sensitivities have been measured for many species of birds. Sound provides birds with information for individual recognition, as well as foraging and predator avoidance cues. However, diving birds often live in hard-to-study areas, and thus, data on the hearing abilities of aquatic birds, especially measurements of their underwater hearing, is lacking. Over 800 species of birds rely on the aquatic environment. Some species, like ducks, can dive to only a few meters, others, like penguins, can dive to over 500 m. Diving birds may depend on underwater sound for navigation. Some birds, such as penguins, auks, murres, and cormorants, may also use sound to locate and pursue prey. Some aquatic birds possess auditory adaptations for hearing underwater. For example, murres and auks have a special structure that creates a barrier over the external ear opening (birds do not have external flaps, or pinna). Penguins have active muscular control of their ear opening. King penguins also have a venous structure in their middle ear that, when engorged with blood, may act as a pressure regulator for the inner ear during diving. This is similar to structures and muscles that surround its external ear and may constrict it, isolating the tympanic membrane from the surrounding waters. Magnetic resonance imaging (MRI) scan of a common murre head (left). The three, orange arrows point to small flaps of skin that are pressed inward with water pressure, creating a barrier between the outer and middle ear and surrounding waters. In the schematic of an auk ear (right), the hatched sections also represent flaps of skin that function in a similar way. MRI image credit: MEEI Radiology and D. Ketten. Auk schematic adapted from Kartaschew and Iljitschew, 1964. The northern gannet has extra air spaces in its head and neck, which scientists propose provide cushioning during impact while diving (these birds can hit the water surface at speeds up to 100 mph). The tympanic membrane of the gannet was found to be thicker than that of the swan, a similar sized bird. This thickening could be another protective measure for plunging and could explain higher hearing thresholds measured for the species. harbor porpoise (blue dots) (Kastelein et al. 2010; Reichmuth et al. 2013) compared with the great cormorant (red dots). Reprinted with permission from Hansen, K. A., Maxwell, A., Siebert, U., Larsen, O. N., & Wahlberg, M. (2017). Great cormorants (Phalacrocorax carbo) can detect auditory cues while diving. The Science of Nature, 104(5–6). In-air auditory thresholds have been measured via auditory brainstem response (ABR) for several species of aquatic birdsCrowell, S. E., Wells-Berlin, A. M., Carr, C. E., Olsen, G. H., Therrien, R. E., Yannuzzi, S. E., & Ketten, D. R. (2015). A comparison of auditory brainstem responses across diving bird species. Journal of Comparative Physiology A, 201(8), 803–815. https://doi.org/10.1007/s00359-015-1024-5.. All species tested showed greatest hearing sensitivity from 1000 to 3000 Hz, with the northern gannet and red-throated loon showing the highest thresholds. Most vocalizations measured for aquatic birds fall between 1000 and 3000 Hz, matching the bandwidth of hearing sensitivity for animals tested. The underwater hearing threshold of a 6-year old, male great cormorant was measured using behavioral testing methods in a large pool with an underwater listening station. The bird learned to detect the presence or absence of a 0.5 s pure tone while submerged. Greatest underwater hearing sensitivity found to occur at 2 kHz with an underwater hearing threshold of 71 db re 1µPa rms (underwater dB). The great cormorant is better at hearing underwater than expected, with a hearing threshold comparable to seals and toothed whales in the frequency band of 1-4 kHzHansen, K. A., Maxwell, A., Siebert, U., Larsen, O. N., & Wahlberg, M. (2017). Great cormorants (Phalacrocorax carbo) can detect auditory cues while diving. The Science of Nature, 104(5–6). https://doi.org/10.1007/s00114-017-1467-3..
Further studies on the underwater hearing abilities of marine birds, as well as data from more than a few individuals, are needed to understand the full range of potential adaptations in aquatic bird hearing and assess sensitivities to anthropogenic noise. Aquatic birds, especially coastal populations, are potentially impacted by underwater sound sources, such as recreational boating, commercial shipping, and coastal construction (pile driving, dredging, etc.). 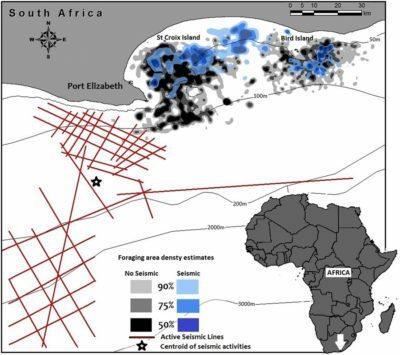 Endangered African penguins showed a strong avoidance of their preferred foraging areas during seismic surveys within 100 km of their colony in South AfricaPichegru, L., Nyengera, R., McInnes, A. M., & Pistorius, P. (2017). Avoidance of seismic survey activities by penguins. Scientific Reports, 7(1). https://doi.org/10.1038/s41598-017-16569-x.. African penguins dive to 30 m deep on average for up to 4 minutes and usually remain within 30-40 km of their colonies when breeding. African penguins raising chicks of 1-3 weeks old increased their distance between their feeding area and the location of the survey vessel when its airguns were active. Overall foraging efforts also increased significantly. Once seismic operations ceased, the penguins returned to normal foraging behavior. 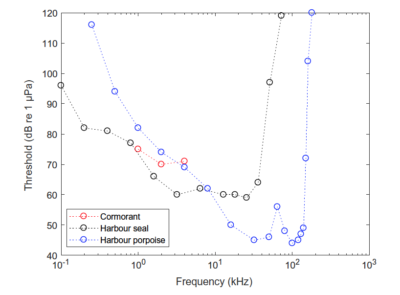 Science of Sound > How does shipping affect ambient noise levels? Hansen, K. A., Larsen, O. N., Wahlberg, M., & Siebert, U. (2016). Underwater hearing in the great cormorant (Phalacrocorax carbo sinensis): Methodological considerations (p. 010015). Presented at the 168th Meeting of the Acoustical Society of America, Indianapolis, Indiana. https://doi.org/10.1121/2.0000267. Sadé, Jacob, Handrich, Y., Bernheim, J., & Cohen, D. (2008). Pressure equilibration in the penguin middle ear. Acta Oto-Laryngologica, 128(1), 18–21. https://doi.org/10.1080/00016480701299667. Ketten, D. R. (2008). Underwater ears and the physiology of impacts: Comparative liability for hearing loss in sea turtles, birds, and mammals. Bioacoustics, 17(1–3), 312–315. https://doi.org/10.1080/09524622.2008.9753860. 1. ↑ Crowell, S. E., Wells-Berlin, A. M., Carr, C. E., Olsen, G. H., Therrien, R. E., Yannuzzi, S. E., & Ketten, D. R. (2015). A comparison of auditory brainstem responses across diving bird species. Journal of Comparative Physiology A, 201(8), 803–815. https://doi.org/10.1007/s00359-015-1024-5. 2. ↑ Hansen, K. A., Maxwell, A., Siebert, U., Larsen, O. N., & Wahlberg, M. (2017). Great cormorants (Phalacrocorax carbo) can detect auditory cues while diving. The Science of Nature, 104(5–6). https://doi.org/10.1007/s00114-017-1467-3. 3. ↑ Pichegru, L., Nyengera, R., McInnes, A. M., & Pistorius, P. (2017). Avoidance of seismic survey activities by penguins. Scientific Reports, 7(1). https://doi.org/10.1038/s41598-017-16569-x.